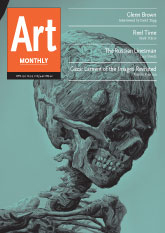 Art Monthly is the UK's leading magazine of contemporary visual art. Published 10 times a year, it keeps you in touch with today's fast-moving artworld through in-depth features, interviews with leading lights, profiles on rising stars and up-to-the-minute coverage of trends from independent critics. In addition to the extensive reviews section covering exhibitions and books, Art Monthly is the only magazine with regular columns on artists' books and multiples, new media, auction activity and legal issues. It is the first with news and views.